Speaking of Panajachel is to speak about the Atitlan Lake, a large endorheic lake (one that does not flow to the sea), which according to some writers, including Antoine de Saint-Exupery, who lived in Guatemala in 1937 and is author of Le Petit Prince, is amongst those classified as the most beautiful lakes in the world. On the road from Solola to Panajachel we are going to see the Tz'ala Waterfall and it is common for the traffic to be slow in the area because people like to stop to take photos and to be photographed with that beautiful background. 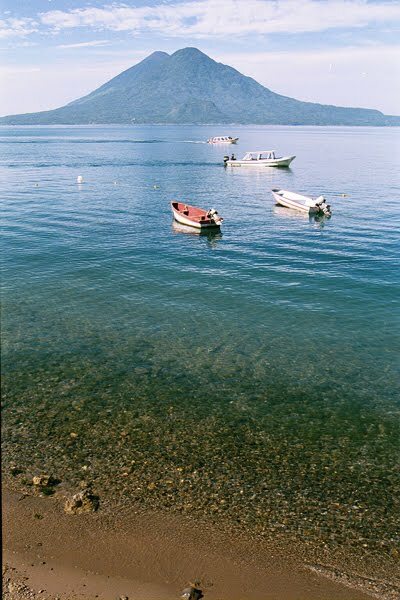 Panajachel is packed with hotels, restaurants, art galleries, Spanish schools and dozens of souvenirs shops along the Santander street and on the shores of the lake. It is a place where people from all over the world have become to settle down and have transformed the town into an eclectic community. Although it has several places interesting enough to be visited, Panajachel per se, has become the center for the tourist trade of the area as it provides a base for visitors crossing the lake to visit other towns and villages. If you decide to explore the place, let me tell you that you will certainly find it interesting, diverse, colorful, even educational. Thus, the star of the picture is the lake, whose name is a Tz'utujil voice that translates as "the place where the rainbow gets its colors". 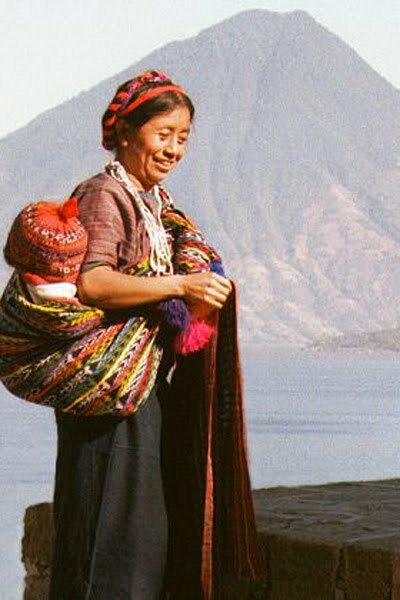 In Guatemala's highlands, especially around Lake Atitlan, the Maya culture still rules. 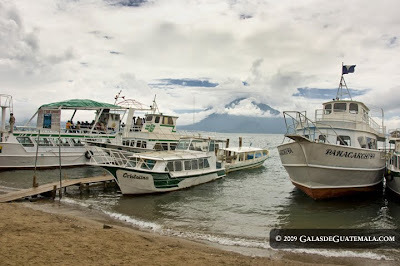 The spirit it invokes is the hidden gem of Guatemala, and makes this one of the most exotic destinations in the world, just as we are about to discover during the next days on board of one of these boats. 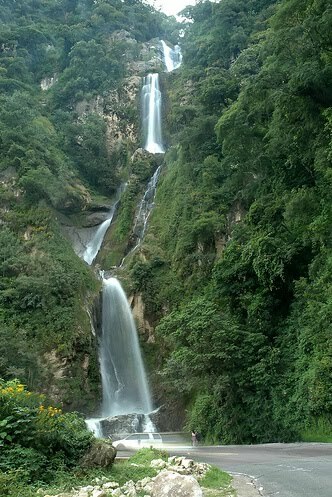 Photos by galasdeguatemala.com, used with authorization. And last but not least, I want to share with you this map to give you an idea about the tour we are going to take in and around the lake. View Lake Atitlan in a larger map. An anonymous reader asked this morning about the health of the lake and if there is any water treatment. What I can say is that the lake is polluted with cyanobacteria (also known as blue-green algae). 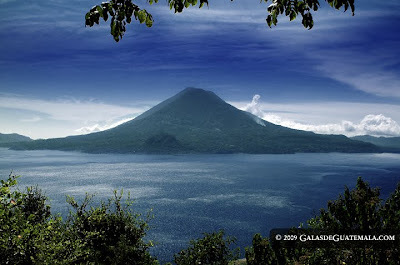 I am not an expert and wouldn't like to give an inappropriate answer, so I recommend you a couple of the Web sites that I have explored: http://www.lakeatitlanhealth.com and http://www.salvemosatitlan.com.